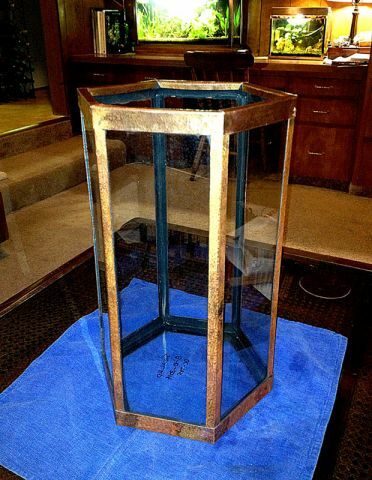 Copper Hexagonal Tank - 4 gallons. Each glass pane is 5" wide x 16" tall. This tank frame is constructed of annealed and split 1/2 copper tube. The split tube is hammered to straighten and flatten it out, also to add hammer marks. 1/2" tube is .625" in OD, so you get a strip just shy of 2" wide. These are cut in half lengthwise, edges cleaned up, and then creased in a bench-top metal break to form the side frame pieces. Top and bottom frames were formed out of two more (whole) strips. The whole thing was then assembled, clamped together, and joints were sweated/soldered with plumber's silver bearing solder. All exposed copper inside the tank is covered with either glass or DC-795, so there is no copper/water contact.